DAYTONA BEACH, Fla. (November 20, 2016) – History has been made. Jimmie Johnson captured his record-tying seventh NASCAR Sprint Cup Series championship with a stirring victory Sunday at Homestead-Miami Speedway, tying NASCAR Hall of Famers Richard Petty and Dale Earnhardt atop the all-time list. Sunday’s win was Johnson’s 80th career victory. To win the 2016 championship, the driver of the No. 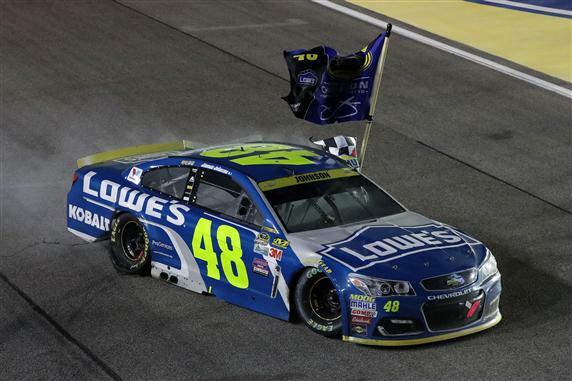 48 Lowe’s Chevrolet outdueled the other Championship 4 drivers Joey Logano (fourth), Kyle Busch (sixth) and Carl Edwards (34th) at Homestead. Johnson breezed through the first round of the Chase, logging his two highest laps led totals of the season to that point at Chicagoland and Dover. When the Round of 12 rolled around, he added his all-time track-record eighth win at Charlotte, leading a race-high 155 laps on the way to a Round of 8 berth. Johnson was the first to lock up a spot in the Championship 4, winning at Martinsville Speedway for the ninth time. At the age of 41, Johnson becomes the youngest seven-time champion. Petty was 42 when he captured his seventh title in 1979; Earnhardt was 43 in 1994. All seven of Johnson’s championships were won under team owner Rick Hendrick and with crew chief Chad Knaus. Hendrick, owner of Hendrick Motorsports, captured his record-extending 12th NASCAR Sprint Cup Series championship. Along with Johnson’s seven titles, Hendrick has won championships with Jeff Gordon (four) and Terry Labonte (one). Also on Sunday, Chase Elliott was named Sunoco Rookie of the Year Award.